Find out more at the Rainbow programme page. 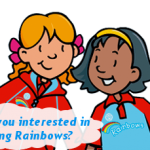 Rainbows follow a programme called the Rainbows Jigsaw, through which they can take part in lots of different activities with girls their own age. Register a girl for Rainbows.